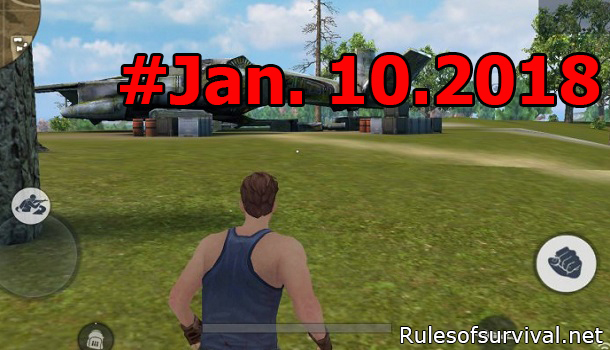 All players of Rules of Survival game always want to get a good gaming experience, therefore, another update is coming out on Jan 10. 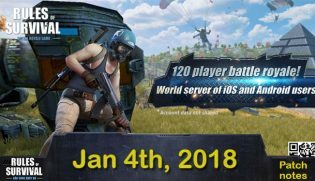 Make sure you won’t miss this new update because there are several nice features added to the game, together with some popular bugs that were fixed, as well as some enhancements made to gameplay, UI, audio and visual effects. 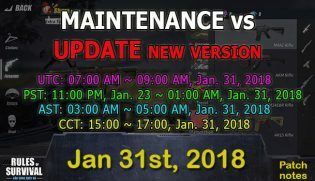 The game will experience this update on Jan 10, so let’s check out the maintenance times before exploring the new things in the update! The period of time for the accomplishment is an approximation, and it may run longer. Forearm camo feature was attached to the game. Now the players are able to switch various camos for their weapons under the Looks interface. For the collected firearms in the combat, they will be altered to the set camos automatically. Camos have no effects on things in the game, excluding for the appearance of the firearms. Bunny Girl is a brand new look in the game, and the store now contains two firearm random camo packs. Made an optimization for the Looks interface. The players are able to use regular Look Shards straightly, developed Look Shards, or even diamonds in order to buy the chase looks. Token Store feature was included in the game. If you share the game daily, you will earn a lot of tokens. Then, you can use them to exchange for several things, like gold, limited looks, and many other great items that are available in the store. With the Token Store, you will surely find further items in the subsequent updates. An Advanced Supply Box was included in the game. Now, you will have an opportunity to obtain specific Punk Set through opening advanced supply boxes. 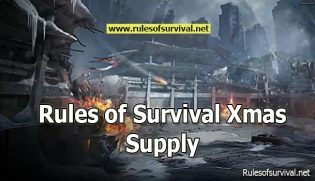 You can only get the special sets through advanced supply boxes or combining advanced Look Shards. You will now experience a nice team-up request feature. Feel free to send team-up requests in the team channel so you can search for more players and ask them to engage in your forces. The Battle Result interface now includes the Spectate feature. This will allow the players to spectate after all of their allies have been destroyed. The zombies can get a broader range of audio cues. The game now includes a brand new action of bicycle passengers. For the passengers, they can sit sideways at the back and hug the one who sits on the front. Xmas supplies have been gone, such as Xmas apples, Xmas candies, and Xmas hats. A sound effect will happen now when the bullets zip past the people. The sound effects of zombies have experienced an optimization. Altered the BGM before the players descend onto the playfield using their parachute. The visual effects of the tactical map were greatly enhanced. After changing the duplicate looks, the details will be shown. When you give a try some looks in the store, you can totally make lots of random poses. The Share Look feature got enhanced. The pictures shared show the kinds of looks, like top, bottom, headwear and more. Already exhibited the remaining validity time of Weekly and Monthly Passes. Displayed the name of the vehicle when it destroys a player. The boats now have a unique get off icon to differentiate from the land vehicles. The display distance of grass underwent an optimization. The sports drink quick command (0) will be shown under its icon from now on. Solved the improper default graphic settings. Solved the uncommon sound effects of footprints when you are dashing and keeping firearms in your hand. A bug making the red notification dots of expired mail show in a wrong way was fixed. Some black spots appear on the Reindeer Pants, and this kind of bug was solved.